I'm an author ('Heavy Metal & You', 'Venomous', and the 'Gravediggers' series), an actor, a metalhead, and a New Yorker. I'm also a journalist for multiple heavy metal press outfits, specifically Revolver Magazine, Invisible Oranges, and MetalSucks. I scream for a local New York doom-metal band named Flaming Tusk; call me Stolas Trephinator. My favorite musicians are Slayer and Frank Sinatra, and my favorite food is gnocchi (it's made of potatoes!). I currently live in Brooklyn, where my life is a haze of records, weird toys, craft beer, and beautiful women. Feel free to follow me on Twitter at @chriskrovatin, and drop me a line about horror, metal, writing, reading, or life at large. I’m a very dark person, but I’m also a total cupcake. Yes, my favorite subjects are incredibly intense and kind of frightening—heavy metal, horror, the occult, true crime—but at heart, I’m really a lover, not a fighter. I think the arch, abnormal, and unequivocal nature of these things attracts me, but I’m overall a rather approachable person and a hopeless romantic. Probably that sitting down and getting the work done is the most important thing you can do. Coming up with ideas is relatively easy a lot of the time, but sitting down and putting them into a rational and ordered form is tough. For a lot of school, I tried to get by on wit, charm, and creativity, and eventually that fizzled out and I was in trouble. It was only when I buckled down and busted my hump that I got anywhere. Weird without work goes nowhere. Two come to mind. One was in an e-mail I received from the comedic novelist Christopher Moore. I had written him about a case of writer’s block I was suffering, and he told me, “It’s easy to be a writer, but it’s hard to stay a writer.” That struck me hard—that being a writer is one thing, but the act of writing, the work of it, is another. You can’t just be content with being a writer, you have to keep it up. The other was from John Burnham Schwartz, an incredible author who also happens to be a family friend of mine. I’d just lost a book deal and was feeling lousy, and we had lunch. And he asked me, “Are you terribly broken up about not publishing this novel? Was this the book you needed to write?” I wasn’t, and it hadn’t been. That opened my eyes. That summer, I wrote the novel I felt I needed to write, a bitter love not to New York City. It wasn’t great and will probably never be published, but it felt so good to get it out. For those who are unfamiliar with your novel; Gravediggers: Mountain of Bones, how would you introduce it? No, but seriously. Three very different young people wander off the beaten path on a school trip, only to find they’ve stumbled into a zombie nightmare beyond their control. Only with the help of their wits and a mysterious stranger can they escape this ravenous horde of the living dead. What was one of the most surprising things you learned in creating Ian? Well, I think it’s easy to write jocks as nothing more than jocks. I think a lot of youth literature likes to write off jocks as bullies and idiots, probably because there are a lot more jock bullies out there than, say, nerd bullies or goth bullies. While writing Ian, I found myself surprised at how often I could find a real emotional resonance there. I wasn’t an athletic kid growing up—quite the opposite—but in writing that kind of kid, I found quite a bit that I could relate to, and realized that I didn’t much care for the stereotype of the sporty kid being a shallow moron. I love horror, and especially zombie horror. But any good artist within that artistic niche needs to make the zombies their own; it’s easy to just bite ideas off of the last guy to make a zombie movie (hence the running zombies in the Dawn of the Dead remake, who skewed too much like the Infected in 28 Days Later). What I wanted to do was make up my own zombie mythology, and to tell it through the eyes of kids, because horror and zombies have always been about my childhood to me, my lifelong fascination with the dark and bizarre. For those who are unfamiliar with Kendra, how would you introduce her? The uber-nerd. Her high exalted majesty Queen Brain. A brilliant young lady with a penchant for constant learning and fact-finding who has begun to crave the action-packed side of the game, the field research, the expeditions. In many ways, she’s so put together, so on top of her game, but in many others, she’s figuring things out as she goes. Tons of heart, but no clue what to do with it. Has a bad habit of assuming that just because she’s the smartest of our three protagonists, which she is, she’s always right, which she’s not. If you could introduce PJ to any character from another book, who would it be and why? First off: excellent question! That’s a tough one. I suppose I’d want to introduce PJ to someone like Tom Skelton from The Halloween Tree, who could share his love of the spooky and maybe make him a bit more fearless. On the other hand, I’d also like to introduce him to someone like Ophelia from Hamlet, someone sad and lost, because PJ’s a great listener and can make you feel better by accepting you and lending a human side to your troubles. At the end of the day, I’d probably say Alonzo King from Brian Selznick’s The Boy of a Thousand Faces, because they both love monsters and monster movies, and would get along being the only weird cinematic kid at their school. 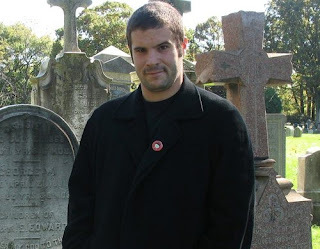 I’m currently working on books two and three of the Gravediggers series, and have a couple of other written projects in the works that I’m not going to talk about quite yet. 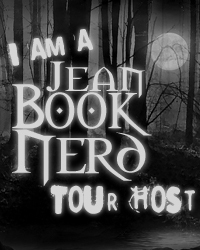 They’re for young readers, and are a lot of fun—that’s all I’ll say. Write like you. Don’t write like Dickens or Hemingway or Lovecraft or Tolkien or Rowling, write like you. Write how you talk, and write what you know. Nothing is more heartbreaking than a young writer trying too hard to sound like their favorite author on the pretense that that is how a writer sounds. And my other piece of advice is, keep at it. Your first pieces will be bad, and people will hate on your work, but you can’t let that discourage you. Keep writing. Practice makes perfect. No one else will do it for you. Good luck. Another tough one! I’ve been a lot of cool places. The one I’m going to have to go with is Qingcheng Mountain in China. At fifteen, I went on a school-sponsored trip for Spring Break where me and a bunch of my classmates traveled all over China—Beijing, Chengdru, Kunming, Suzhou, and Shanghai—that was totally incredible. In the Sichuan province, we traveled to Qingcheng, which is one of the Four Sacred Mountains of Taoism. I remember hiking for what seemed like miles chanting the Beastie Boys’ “Paul Revere” with my friend James, then reaching the top and eating a bowl of noodles while overlooking this mind-blowing landscape of misty mountaintops. It was one of those moments I’ve never forgotten, but still wish I could remember better. Tell me about your strangest dream? Yikes. Okay, here’s a weird one I’ve had recently—not my strangest, but pretty funny. I had this dream where I was performing Jimmy Cagney’s Man of a Thousand Faces as a stage play, and I hadn’t studied my lines. I was playing Lon Chaney. The audience was a bunch of stodgy late-1800s businessmen, and they were not amused with my ad-libbing. I think it means I hate your mother. Eh, I’ve had a lot of luck with summer jobs. As a teenager and in college, I worked at Scholastic Books as an intern under the great David Levithan. Never flipped burgers, never scrubbed toilets. So overall, I lucked out. The worst job I’ve ever had, period, was washing dishes at a vegan restaurant. The staff and owners were great, and I got to blast death metal and drink milk shake ends all day, but vegan cheese burns to the bottom of a pot in a really awful way that results in your scrubbing like an insane person. Vegan cheese, man—even thinking about it makes me tired. What did the last text message on your phone say? I’m afraid it relates to the recent loss by the New York Giants against the Philadelphia Eagles, so let’s just say it’s not appropriate for mixed company. See, I cry all the damn time at media—movies, books, music, that gets me going easily. If they involve a dead kid, bam, I’m done. Tiny Tim? Don’t get me started. So the last time I cried was on the subway in New York reading the end of Martin Amis’ Koba the Dread where he talks about burying his younger sister. That got me going. You can find me on Facebook, and my Twitter handle is @chriskrovatin. Also check out my writings on revolvermag.com and steelheadentertainment.com. Though, kids, if you’re reading this, talk to your parents before reading my non-Gravediggers stuff, okay? Ian was the one who chased the majestic buck into the forest. Kendra and PJ followed him. They all hoped to return to the hiking trail before anyone noticed they were gone. However, the mountain had other plans for them: dark, sinister plans that only nightmares are made of. The Goonies meets The Evil Dead in this series about three kids who become separated from their backpacking group in the Montana wilderness and discover they are stranded in the heart of zombie country. Kendra didn't want to become separated from the other sixth graders, but she followed Ian anyway, despite what her analytical mind told her. PJ followed him, too. Even though he was scared, he figured he might catch some amazing footage with his video camera. They all hoped to return to the hiking trail before anyone noticed they were gone. However, the mountain had other plans for them: dark, sinister plans that only nightmares are made of. Now they don't know where they are. They don't know how to get home. They don't know what gruesome creatures lurk in the shadows-but when they find out, will they be able to defeat these monsters and escape the mountain together? This first book in the Gravediggers series is a scary, mysterious, wild ride that will thrill readers to the very last page. 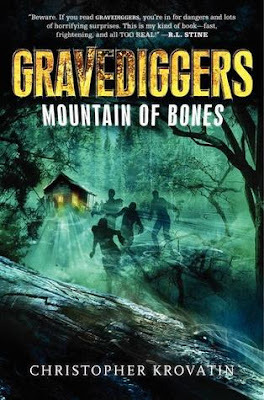 Christopher Krovatin’s Gravediggers: Mountain of Bones centers on sixth graders Ian, PJ, and Kendra who are put together for a week of science camp in Montana. Ian is a persistent jock who attempts to be popular and is friends with the skinny movie-buff, PJ. Their friendship has limitations as they do not acknowledge one another at school because Ian fears that he will be teased for hanging out with PJ. They have no kind of interaction with the school geek, Kendra except for the time Ian teased her for her geekiness. On one of their camp activities, the three would rather be doing something else and they decide to follow a buck that Ian spotted. The more they followed it, they realized that they are lost. After being lost for quite some time, they take refuge inside an abandoned cabin. Soon, they realized that it is not even near abandoned as they discovered a skeleton in the basement and have become the human targets for zombies. Soon they are trying to outrun the zombies while dealing with the obstacles within the forest. It is rare to read a book that is very well written and makes your heart beat out of your chest. But this is exactly what Christopher brings to the table. Although it is labeled as middle-grade level, the author does not pay attention to its limitation and provides a very spine-tingling story. Each scene in this book is incredibly creepy. The writing style has closeness to it as readers are given first-hand account of their fears. I love how Christopher mixes horror and humor. It is perfectly proportioned. The story behind the zombies’ origins and the magic in the woods are unique and a fresh take on this very familiar genre. Readers will devour the pages rather quickly due to its gripping plot and entertaining characters. Although the scare factor is set high and the violence is a bit over the top, it is still just right for the middle-grade readers. This first book in the series will surely get readers excited for the second book. Thank you Chris for making this giveaway possible. 1 Winner will receive a Signed Copy of Gravediggers: Mountain of Bones by Christopher Krovatin. I love Indiana Jones movies!! If I could go through one of Indiana's adventures that would be my dream adventure! Dream adventure? To go on a trip in the TARDIS! Allons-y. I would love to see Europe someday. My dream adventure I would love to find an island no one has been on in years and live and explore it for about a year or so. Dream adventure . . . I'd love to go trekking through the Alps sometime. Or go camping in Australia. Or just do something badass, like going into outer space. going to Spain & doing the hole boot! Run off to New Zealand!! I love that country. Wouldn't mind doing some bungee jumping! dream adventure? traveling around Africa in a safari!! !